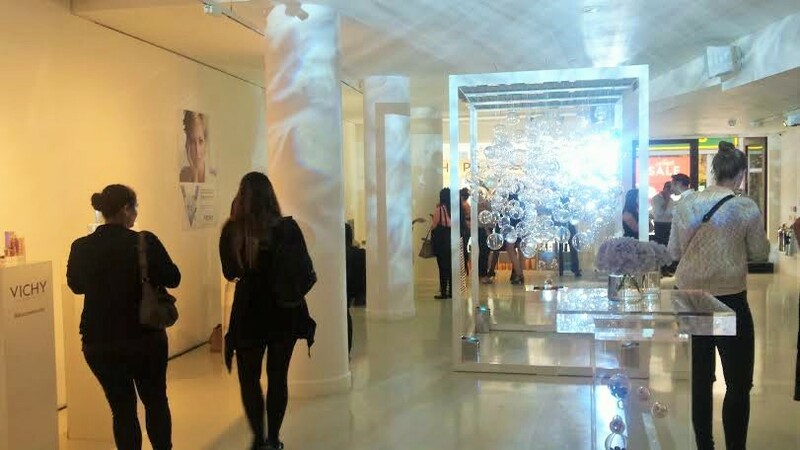 When you put Vichy Laboratoires together with the Rook & Raven contemporary art gallery based in London’s Soho you get a stunning event where all the skin care products are lit and presented as art installations! 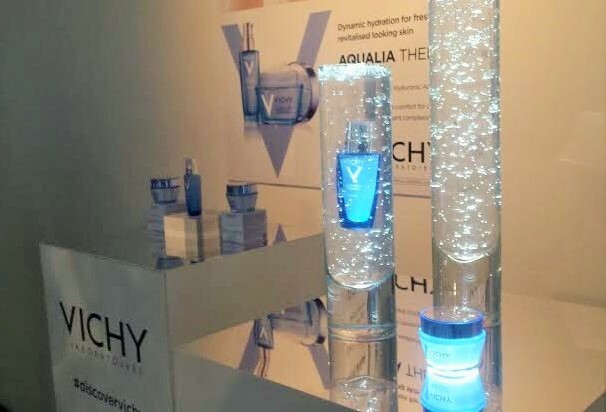 My favourite serum of all time, Vichy’s Aqualia Thermal Serum was one of the first to catch my eye with its clear blue glass bottle. 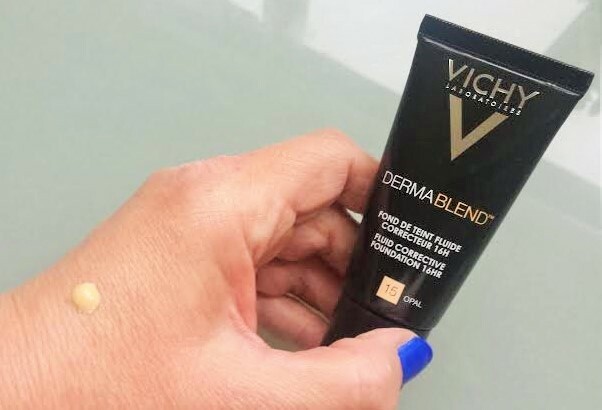 It was just one among several products both well-known and loved Vichy favourites and new launches. It was a great opportunity to meet up with blogger friends and make new ones – here’s Angelica from One Little Vice being colour matched for Vichy Dermablend Fluid Corrective Foundation by make-up artist Claire Ray . I’d forgotten that Vichy do foundations and powder so this was a good reminder and chance to try one out. 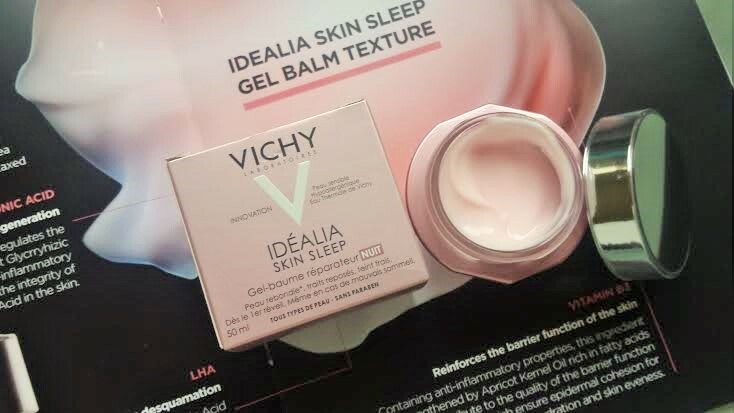 I was introduced to the new night cream that’s said to be capable of recreating the restorative effects of deep sleep – Idealia Skin Sleep. It has a gel balm texture that I tried for the first time last night. I won’t tell you more now. I’ve brought a few bits home with me to try, and you’ll need to wait until I’ve had time to trial them properly before I review them in detail. 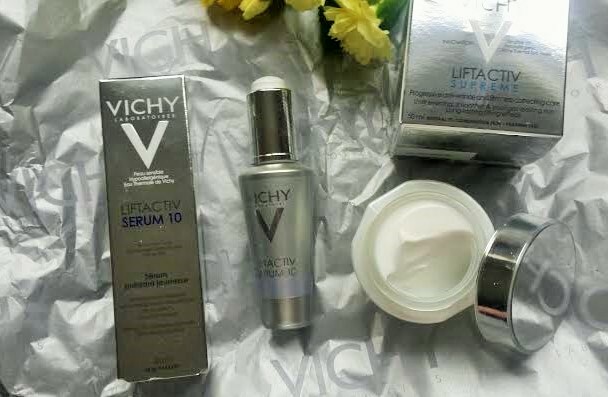 We were all invited to select two products to try from the “Vichy Pharmacy” and I selected two Liftactiv products. The Liftactiv Serum 10 which I was told I would love even more than my favourite (a hard act to follow) and the Liftactiv Supreme. While I was waiting in the queue for the pharmacy I met Nital Shah who blogs at surangi-style.com – it’s so lovely when people who you’ve only ever seen on social media come and say hi. And it’s even better when you get served the odd strawberry daiquiri at the same time! So thanks to Vichy for a lovely evening. Do look out for reviews in a week or two. I have to say I can’t remember a Vichy product I didn’t like. But we’ll see. Is Vichy one of your favourite brands?